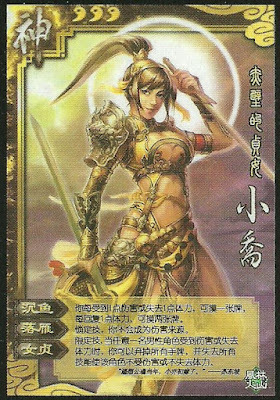 For every health Xiao Qiao loses, she draws a card. For every health Xiao Qiao recovers, she draws two. Xiao Qiao is never considered the source of any damage. When a boy is hurt, Xiao Qiao can choose to lose all hand cards and pwoers to prevent that boy from taking damage. "Purity" can only be used once by Xiao Qiao. Afterwards, she loses that and other other powers as well.